SNAP!, exhibition view, Da Monsta, The Glass House, 2013. Courtesy of the Glass House, National Trust for Historic Preservation. Photo: Andy Romer Photography. The Glass House is pleased to announce its first site-specific exhibition: SNAP! by E.V. Day. Conceived for the building known as Da Monsta—designed by Philip Johnson in 1995 as a visitor center and now a gallery—SNAP! interprets the pavilion’s peculiar geometry and atmosphere both inside and out. 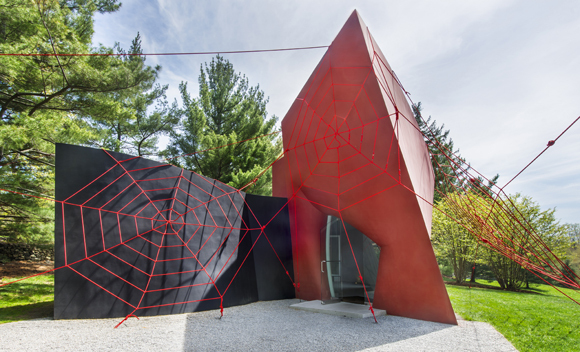 Day has roped the exterior of Da Monsta with massive climbing webs and populated the interior with an ensemble of recent sculpture that tease out the noir qualities of Johnson’s late work. Da Monsta, located near the Glass House gate, is a jagged neo-Expressionist building of curves and contours. Responding to Johnson’s statement that “the building is alive,” the artist has cast a net, capturing and staking Da Monsta to the ground. The dynamic interplay between Day and Da Monsta continues inside. Five recent sculptures—Spinneret (a study for Spidey Striptease), Silver Mummified Barbie, Wet Net, Pollinator, and Bandage Dress (white with chain)—occupy the first gallery. The second gallery presents an installation of tight directional lines that ricochet from Da Monsta’s unique contours. The vibration of a purring beast below the floor further exposes its strange alive-ness. The Glass House will also debut Gnomon/Wave Fulgurite l.l, a new work by New York-based artist Tauba Auerbach for Night (1947–2015), a “sculpture-in-residence” series presented on the Mies van der Rohe glass coffee table inside the Glass House and Still Life (Glass, Grass, Sky, Sand) by ARP for Night Sounds, a new performance series that parallels the exhibition, Night (1947–2015). Night (1947–2015) and Night Sounds contribute to the National Trust for Historic Preservation’s larger goal of re-imaging historic sites for the 21st century by bringing catalytic change to its sites around the country. The guiding principles of this initiative are that historic sites must be dynamic, relevant, and evolving and that they must foster an understanding and appreciation of history and culture that is critical, layered, and sensory. Auerbach’s first sand sculpture, Gnomon/Wave Fulgurite l.l, evokes a solid wave of light composed of tiny particles. The physical form of the work resembles that of a gnomon, the vertical component of a sundial that casts the shadow from which time is measured. Throughout the day, Gnomon/Wave Fulgurite l.l will cast a moving shadow along and through the glass table on which it rests. It will be on view until early September 2013. About the Glass House: Built between 1949 and 1995 by architect Philip Johnson, the Glass House is a National Trust Historic Site located in New Canaan, CT. The pastoral 49-acre landscape comprises fourteen structures, including the Glass House (1949), and features a permanent collection of 20th century painting and sculpture, along with temporary exhibitions. The tour season runs from May to November and advance reservations are required. For more information about programs, events, and to purchase tickets, visit www.theglasshouse.org. Tours begin and end at the Glass House Visitor Center 199 Elm Street, New Canaan, Connecticut, 06840, USA. Tickets by phone: T 866 811 4111. Advance reservations are necessary. 1:20 hour train ride from Grand Central Station, New York.